There’s a roar in the desert! It’s the terrific sound of the all-new 2017 Ford F-150 Raptor, running in the 2016 Best in the Desert off-road racing series’ new factory stock class. The Ford F-150 Raptor race truck will leverage Raptor’s production platform including its all-new high-output 3.5-liter EcoBoost® engine and 10-speed transmission, along with torque-on-demand transfer case. 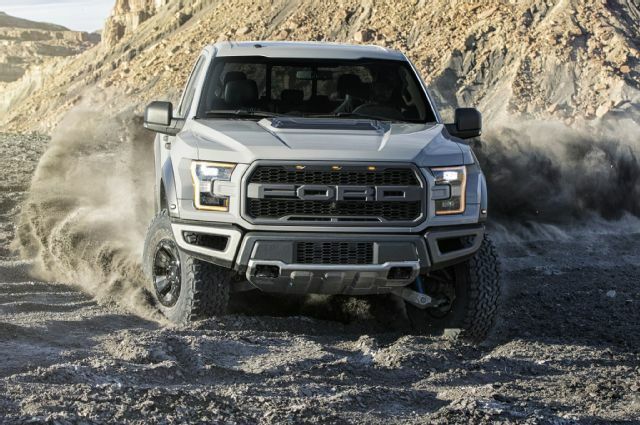 “The all-new Raptor has the DNA of a Baja race truck, with a purpose-built engine, chassis and suspension that enables it to travel fast over challenging desert landscapes or crawl over rocky terrain,” said Jamal Hameedi, chief engineer, Ford Performance. Putting the all-new Ford F-150 Raptor through this grueling stretch of races will help to prove how a truck born in the desert is even more prepared to conquer the very demanding terrain. Production foundation: The purpose-built fully boxed frame of the all-new Raptor features more high-strength steel than the departing Ford F-150 Raptor. F-150 Raptor’s sculpted looks are reminiscent of Trophy Trucks – the fastest and most powerful class of off-road pickups. The Ford F-150 Raptor is six inches wider than the standard Ford F-150 for improved stability off-road. Technology to race smarter: F-150 Raptor is powered by Ford’s second-generation high-output 3.5-liter EcoBoost engine that produces more power with greater efficiency than the previous 6.2-liter V8 engine. It’s rated at 411 horsepower and 434 lb.-ft. of torque. The new 3.5-liter EcoBoost is a Raptor-exclusive in the Ford F-150 lineup and has been paired with an all-new 10-speed transmission for improved efficiency. For more information about Ford’s awesome line of trucks, give us a call here at Beach Automotive today!